Simon Haas offers a variety of workshops and interactive seminars on the yoga wisdom of the Bhagavad Gita, the Dharma Code and teachings from the tradition of Bhakti-yoga, the yoga of loving service. These can be structured to meet the specific needs of your audience, your yoga teacher’s training course, or any special focus of your group. These are just a few of the yoga studios and events that have invited Simon Haas to speak. These can be structured to meet the specific needs of your audience, your yoga teacher’s training course, or any special focus of your group. If you would like to invite Simon Haas to speak at your event, please contact us below. Do you want to take your yoga practice beyond your mat? Do you want to improve your ability to make conscious choices? Join Simon Haas, author of The Book of Dharma, and discover an age-old system using four universal yoga principles for making enlightened choices in your life and fulfilling your highest potential. 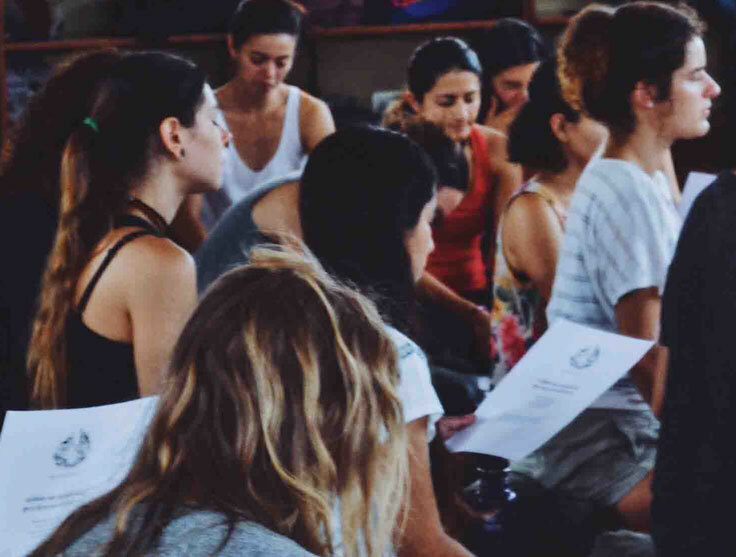 This interactive Dharma workshop makes ancient yoga philosophy easily accessible, empowering participants to make decisions aligned with their true purpose. Explore the Bhagavad Gita’s teachings on harnessing the power of yoga during times of difficulty or crisis. In this interactive seminar with Simon Haas, we will examine the four signs of a dark night of the soul, and explore how to overcome fear, lamentation and confusion: the three types of suffering associated with time. Join Simon Haas, author of Yoga and the Dark Night of the Soul, for a lively introduction to the Bhagavad Gita as a yoga text. Suitable for both long-time students of the Gita and for those who may be unfamiliar with the text, this interactive seminar (or seminar series) explores the Gita’s eighteen yoga systems, focusing on immediate practical application in daily life. In daily life, especially our work, we may feel tired, disconnected, uninspired or bored. Alternatively, we may be deeply attached to outcomes, very controlling, and always anxious about the future. These are all unskilful ways of acting. Karma-yoga, the yoga of skilful action, allows us to discover our purpose and find deep fulfilment by living in accord with our nature. In this seminar, we’ll explore the three easy steps of Karma-yoga. In the Bhagavad Gita, Krishna’s very first teaching to Arjuna is to remember who he is. We are not this physical body we inhabit, Krishna explains, which is like a machine or a garment. Neither are we our mind-made self, with all its problems and heavy burdens, which lives between the unsatisfying past and the fearful future. We are spiritual beings. Once we remember who we are, we can act on the field of life with freedom, clarity and power. In this seminar, we will explore the Bhagavad Gita’s teachings on the gunas, three dynamic qualities that combine to create our perceptual world. We will learn how best to use the gunas (1) in our communication, (2) in the way we begin or end a project or a relationship, (3) in how we teach and practise yoga, (4) in what we choose to eat and consume, and (5) in the way we perceive and approach time. Being able to differentiate between the three gunas helps us be more effective in our daily life, and is itself a form of yoga. If there is time, we’ll also explore how an advanced yogi or yogini transcends the three gunas. The “wealth of the gods” is a precious cache of unearthly qualities: fearlessness, strength, discipline, love, kindness, peace, vitality, patience, inspiration and much more. Culturing these helpful qualities—amassing this type of capital, the “wealth of the gods”—is a form of yoga, the Bhagavad Gita explains. In this seminar, we’ll explore where to find the treasure of the gods and goddesses, as well as how to collect this wealth through asana, or yoga postures. In this interactive seminar with Simon Haas, we’ll explore how we can engage our heart in our yoga practice. We’ll examine the difference between “small love” and “sacred love”, and discover what nourishes sacred love and what harms it. This will give us the tools we need to write the most beautiful life story we are capable of, one composed of love and compassion. Explore the ancient technique of creating an infallible intent. When performed correctly, a sankalpa has the power to reshape our destiny. The Sanskrit sankalpa means “definite intention” or “resolve”. A sankalpa takes our deepest desire, and manifests it in the world. It gives it a form. What that form looks like depends upon the command given to the mental force by the one making the sankalpa. This a powerful technique in yoga. Can we practise yoga through our relationships? In this interactive seminar, we’ll explore ways to take our yoga practice beyond the yoga mat and make it a guiding life practice through our relationships. Discover ancient methods and techniques for enhancing our relationships, so that they create vitality and fulfilment. Simon’s workshops aim to empower participants, helping them lead a life true to themselves, show deep kindness and compassion to others and to themselves, and rupture cycles of habitual suffering. To organise a workshop or seminar, please fill out the form. We strive to reply within 48 hours.